Where is Bob? 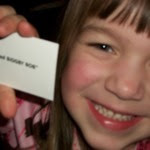 : Guest Blog -- Is BIGGBY BOB a Tooth Fairy? Guest Blog -- Is BIGGBY BOB a Tooth Fairy? My daughter who is now five years old is a big Biggby fan. 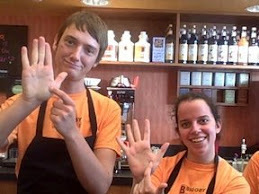 It started when I took her to her first "Spot Bob" and Bob gave her a card for a free drink that said "I spotted Biggby Bob". Since then she always asks to go back. A little while back she had a loose tooth - her first one. It was a Sunday, and I told her that if she lost her tooth on a Sunday, that the Biggby fairy would come and leave a gift card under her pillow... In reality, I just wanted to pull the tooth out so she would not continue to freak out about it. Well, the short story is she would not let me pull it out, it fell out later that week... and the Biggby fairy did not come. HOWEVER, just by chance... she has now had a steady pattern of losing teeth on Sundays, and yes, she never forgets, the Biggby fairy comes on Sundays. 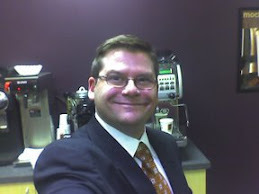 See you next week at the Spot Bob, until then I will be hanging at the Novi Biggby with all the regulars. No, he's not the Tooth Fairy. Catch the real Tooth Fairy whenever that next tooth pops out. Biggby Bob as the Tooth Fairy? My head explodes at the mere thought. Talk about a spook story to tell your kids. They won't sleep for a week. Peppermint Stick Mocha comes alive --- Thanks!